Lake Nona is a massive community that was recently constructed in the Central Florida area. This master community is one of if not the most artistic and well planned demonstrations in the area. With over seven thousand acres of construction space and a variety of waterways and lakes in the preexisting area it is easy to see why the location was chosen. Lake Nona boasts that it is just a short distance away from every major attraction in Central Florida, including Sea World, the Universal Resort and the Disney World Resort. 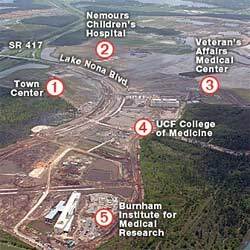 This massive installment that will have a complete 134-bed hospital as well as adjacent buildings for research and diagnostics is going to put Lake Nona on the radar. This expansion will offer a wide variety of jobs for new med students as well as those with the highest knowledge in their particular fields. This means that the economical value of Central Florida will sky rocket even more! 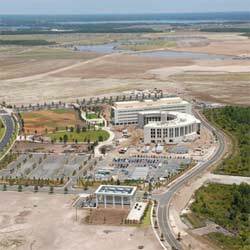 With people coming from all over the world to assist in the future of medical studies Lake Nona and the surrounding area will see a massive growth. The fantastic complex is scheduled to open in late 2012, just two short years away. With this massive 665$ million dollar budget these complex facilities will feature some of the highest technical equipment. 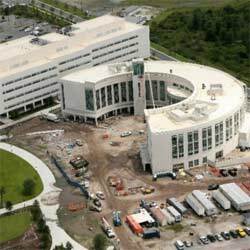 In February ground was broken for the Nemours Children’s Hospital, another step in the direction of completion. This 620,000 square foot children’s hospital will house a total of ninety five available beds for children with “incurable” diseases. 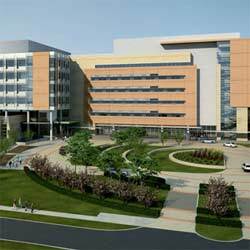 Here at the new hospital fresh med students as well as the experienced will work together to find cures for these rare cases. With many more public announcements to be made in the future the incredible “Medical City” as it has been called will be releasing more information on the developments as well as changes to plans. However, you can rest assured that the area will see its growth and development the closer this area nears to completion! It is also important to note that while this great investment will help in the bettering of the medical world it will also serve as a learning grounds for upcoming students. University of Central Florida is opening a "College of Medicine" directly in the center of all the research and medical institutes. This will offer students up close and personal encounters with the real medical world, where they can practice what they have learned in class by observing experienced and professional doctors and researchers in their own professions. This great opportunity can be found at very few college campuses, and betters the medical community by presenting actual applications to students at a very early stage. The future of medical research will take place right here in Central Florida!